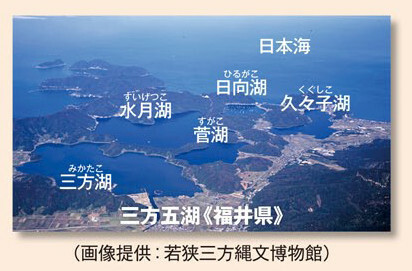 A national selected natural beauty spot, Mikata five Lakes is extending over Wakasa-cho, Mihama-cho. 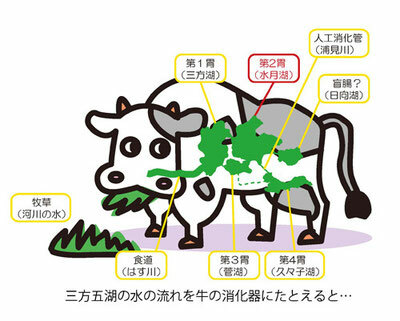 In a waterway and a canal, water totally drifts like the stomach of the cow like a connection, a river, and each lake flows into Wakasa-wan Bay. "The diary" which the earth kept still stays at the bottom of a maximum lake, Lake Suigetsu existing at the middle reaches. The opposite bank of the Lake Mikata presses the north for National highway No. 162 before long via some villages while watching Lake Mikata on the right hand when I go. The surface of the water becomes large again and enters Lake Suigetsu via a small waterway. Lake Suigetsu, 34m in depth, a cross section of 2km in width is a lake of the form such as a frying pan. In the neighboring mountains in thick form coming out from a picture book, it is rare that strong wind lets a surface of a lake be high. This is one of the big reasons why "a diary" remained. What is this "diary?" The tree leaves a growth record of one year as an annual ring for one year. In the same way, at the bottom of a lake soil of Lake Suigetsu, the lake leaves it as a striped pattern of the sediment. It is "an age stripe" called valves. As a result of bowling investigation, it was checked that valves started from 70,000 years ago and has continued to the current bottom of the lake. For the past 70,000 years, the pollen which flew fell from the trees around the lake on the surface of the water and was taken in valves. The pollen knows the past climate environment if we turn up this diary what kind of trees grew because it is the index that what kind of climate environment was in its turn. In addition, it may be said that a flood or an earthquake are generated because mud more than usual times is piled up in the bottom of a lake even if valves record the history of the disaster exactly. As for the earth, valves for 70,000 years will be like the diary which it kept diligently. A creature does not live in the calm Lake Suigetsu below depth of the water 10m. The lake is not stirred by wind, and this is because oxygen does not turn to near the bottom of the lake. 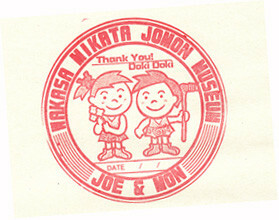 The environment continues for 70,000 years where no creature exist tearing or erasing a diary. The diary will remain in future as far as this quiet environment spreads out.